New styles of football trophies are coming out everyday.?? The traditional trophies are always a good option for team trophies.?? 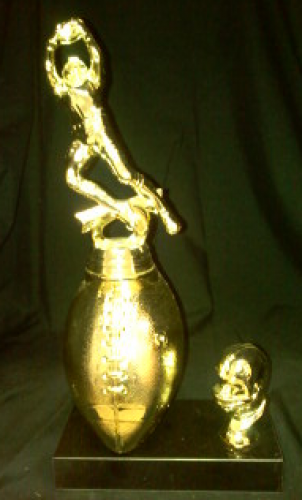 We have a few different styles of the traditional football trophies. This is the most simple yet rewarding trophy. Choose the figure on top and the type of column. The football trophy with helmet trim is a different look. These trophies have a larger base that leaves a little bit more room for engraving.